FSA. You can contribute up to $5,000 pretax to an employer-sponsored child and dependent care Flexible Spending Account. The plan pays or reimburses you for these expenses. You can’t use those same expenses to claim a tax credit. IRAs can be perfect for teenagers because they likely will have many years to let their accounts grow tax-deferred or tax-free. The 2015 contribution limit is the lesser of $5,500 or 100% of earned income. A teen’s traditional IRA contributions typically are deductible, but Family and education tax breaks make raising kids less costlyFAMILY & EDUCATION7distributions will be taxed. Roth IRA contributions aren’t deductible, but qualified distributions will be tax-free. Choosing a Roth IRA is typically a no-brainer if a teen doesn’t earn income that exceeds the standard deduction ($6,300 for 2015 for single taxpayers), because he or she will likely gain no benefit from the ability to deduct a traditional IRA contribution. Even above that amount, the teen probably is taxed at a very low rate, so the Roth will typically still be the better answer. If they don’t have earned income and you own a business, consider hiring them. As the business owner, you can deduct their pay, and other tax benefits may apply. Warning: The children must be paid in line with what you’d pay nonfamily employees for the same work. parents’ marginal rate, if higher, rather than their own typically low rate. Keep this in mind before transferring income-generating assets to them. The plans provide estate planning benefits: A special break for 529 plans allows you to front-load five years’ worth of annual gift tax exclusions and make up to a $70,000 contribution (or $140,000 if you split the gift with your spouse). The biggest downsides may be that your investment options and when you can change them are limited. Coverdell Education Savings Accounts are similar to 529 savings plans in that contributions aren’t deductible for federal purposes, but plan assets can grow tax-deferred and distributions used to pay qualified education expenses are income-tax-free. One of the biggest ESA advantages is that tax-free distributions aren’t limited to college expenses; they also can fund elementary and secondary school costs. ESAs are worth considering if you want to fund such expenses or would like to have direct control over how and where your contributions are invested. But the $2,000 contribution limit is low, and it’s phased out based on income. (See Chart 1.) Amounts left in an ESA when the beneficiary turns age 30 generally must be distributed within 30 days, and any earnings may be subject to tax and a 10% penalty. American Opportunity credit. The tax break covers 100% of the first $2,000 of tuition and related expenses and 25% of the next $2,000 of expenses. The maximum credit, per student, is $2,500 per year for the first four years of postsecondary education. The credit is scheduled to be available through 2017. Lifetime Learning credit. If you’re paying postsecondary education expenses beyond the first four years, you may benefit from the Lifetime Learning credit (up to $2,000 per tax return). Student loan interest deduction. If you’re paying off student loans, you may be able to deduct the interest. The limit is $2,500 per tax return. Warning: Income-based phaseouts apply to these breaks (see Chart 1), and expenses paid with distributions from 529 plans or ESAs can’t be used to claim them. 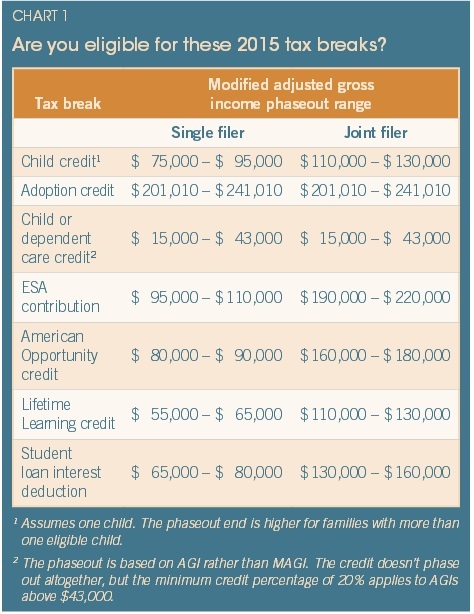 If your income is too high for you to qualify for a credit, your child might be eligible. But if your dependent child claims the credit, you must forgo your dependency exemption for him or her (and the child can’t take the exemption). Who’s affected: People with disabilities and their families. Key changes: The Achieving a Better Life Experience (ABLE) Act of 2014 offers a new type of tax-advantaged savings program for people who are disabled or blind. The act allows states to establish tax-exempt ABLE programs to help people with disabilities build accounts that can pay qualified disability expenses. Anyone can make contributions to ABLE accounts, but the contributions won’t be deductible. Income earned by the accounts generally won’t be taxed. Distributions, including portions attributable to investment earnings generated by the account, to an eligible individual for qualified expenses won’t be taxable. Qualified expenses are those related to the individual’s disability, such as health, education, housing, transportation, employment training, assistive technology, personal support, and related services and expenses. Planning tip: Contact your tax advisor for the latest information on the availability of ABLE accounts in your state.